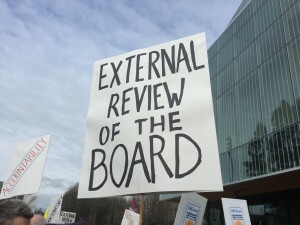 UBC faculty, staff, students, and citizens turned out in mass to protest the Board of Governors’ unaccountability and damaging lack of transparency. The message being enough is enough. We’re fed up with the the backroom politics that are pervasive enough to move a new President out of office with no review, rhyme nor reason. 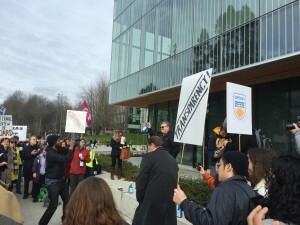 After a rally in front of the Alumni building, the protest proceeded upstairs to the door of the Board meeting. The disruption was direct and effective, with a subset marching into the meeting. 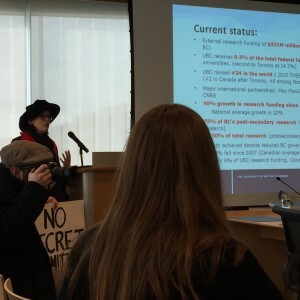 Chants of ‘hey hey, ho ho, the BoG has got to go’ roaring outside the door and the Board’s discomfort inside. Shockingly, the Board allotted time for a colleague to speak out at the mic! 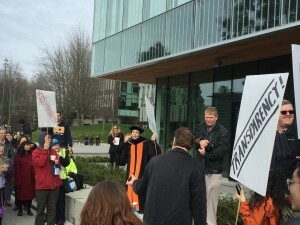 Amazing demonstration of the grass roots on campus everyone! Next time we may move to occupy.